storage capacity while boosting efficiency through the use of high-tech tracking systems. The $25 million facility - the firm's second in Jurong - has 2.3ha of floor space and employs 85 people, about half of whom are locals. It can store 600,000 tyres, increasing total capacity across both warehouses to one million. The Singapore-listed firm said in a statement that the centre will support its "expanding total tyre management businesses in South-east Asia". Stamford president Wee Kok Wah said the previous warehouse offered "limited storage capabilities". "The redeveloped warehouse optimises land use... to support the international proprietary brand tyre and wheel distribution operations," he added. The centre has an 18m-high ceiling and Singapore's tallest racking for tyres. A barcode system cuts by half the time needed to process inventory. A truck servicing facility with six service bays offers "full life-cycle" services in one place, including retreading and wheel balancing. Large firms such as port operator PSA and public transport operators SMRT and SBS Transit are already among the centre's customers. 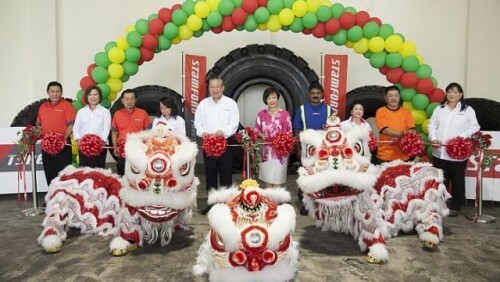 The facility marks a shift back to South-east Asia for Stamford Tyres. It was partially funded by $12 million in net gains from the 2012 disposal of its stake in SRITP, a joint-venture Chinese tyre distribution company. Mr Wee told The Straits Times yesterday: "We chose to take the money and put it back in South-east Asia, our home." Driving organic growth in the firm's operations across the region is the focus for now, he added. Thailand, Indonesia, Singapore and Malaysia account for about 80 per cent of the group's business today. Stamford Tyres was founded in the 1930s by Mr Wee's father, the late Wee Boon Kwee. It now has a distribution presence in 13 countries across the Asia-Pacific region and Africa, with more than 1,200 employees. In addition to distributing major international tyre brands including Falken and Dunlop, Stamford also sells its own brands such as Sumo Firenza and Sumo Tire globally. It reported a net profit of $838,000 for the three months to Jan 31, down 63 per cent from $2.2 million for the same period a year ago. This was mainly attributed to an unrealised loss of $1.6 million in "doubtful receivables" due to collection issues the firm faced in Indonesia. Stamford Tyres shares closed flat at 37 cents on Thursday, the last day the stock traded. STAMFORD Tyres Corporation opened a new commercial centre and warehouse yesterday that doubles its storage capacity while boosting efficiency through the use of high-tech tracking systems.